Japanese investment will play an important role in linking India’s northeast with Myanmar and Bangladesh. Indian Prime Minister Narendra Modi, in his three years in office, has repeated his commitment to increasing the involvement of northeastern states in the country’s outreach toward Southeast Asia. During his visit to Assam, for the inauguration of the 9.15-kilometer Dhola-Sadiya Bridge (India’s longest), Modi reiterated the role of the northeastern region in India’s Act East Policy. “For this, we are laying stress on development of infrastructure and making the northeast a tourism center. Lakhs of tourists would also come to Kamakhya temple and improve the economy,” Modi said. He also made a similar point addressing the meeting of northeast council. The Modi government allocated over 370 billion rupees ($5.8 billion) for infrastructure of the northeastern region in the last budget. The Modi government has been paying special attention to key infrastructural projects that will enhance connectivity with Myanmar. These include key projects such as the India-Myanmar-Thailand highway and the Kaladan Multi-Modal Transit Transport Project. An interesting development has been the participation of Japan in key infrastructure projects in India’s northeast. This has sent a strong message to China that New Delhi will explore all possible options. In April 2017, the Japan International Cooperation Agency (JICA) signed an agreement with the Union government in New Delhi to provide over 67 billion yen ($610 million) for Phase I of the North East Road Network Connectivity Improvement Project. Phase 1 will see the enhancement of National Highway 54 and National Highway 51 in Mizoram and Meghalaya. NH-54 is located in central Mizoram, and a stretch of the targeted section of NH-54, spread over 350 kilometers, extends from Aizawl to Tuipang in Mizoram. The improvement of NH-54 is not just vital for the state, but also will enhance connectivity of the Kaladan Multi-Modal Transport Corridor, which seeks to link India’s northeastern states with the rest of India via Myanmar, by roads, inland water transport, and marine transport. These projects will also complement the Indo-Pacific Economic Corridor, something the previous U.S. administration had pushed for. The Corridor seeks to enhance connectivity between South Asia and Southeast Asia through Myanmar and Bangladesh. Japanese participation in the northeast is very much in sync with the December 2015 declaration issued during Japanese Prime Minister Shinzo Abe’s visit. 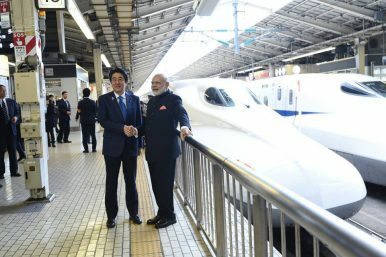 Seeking synergy between India’s Act East policy and Japan’s “Partnership for Quality Infrastructure,” Abe and Modi agreed to create top class, durable infrastructure that would improve connectivity not just within India, and between India and other countries in the region. This cooperation between India and Japan is of course not restricted to South Asia and Southeast Asia. India and Japan will work jointly to enhance connectivity between Asia and Africa as well. During a meeting of the African Development Bank (AfDB) in Ahmedabad, Modi released a vision document on the “Asia Africa Growth Corridor (AAGC),” an idea which had been discussed during his visit to Japan in November 2016. Of late, there has also been greater interaction between northeastern states and Japan. On May 20, Japanese Ambassador to India Kenji Hiramitsu visited Imphal, the capital of Manipur, where he paid floral tribute to all people who lost their lives in the battle of Imphal 73 years ago. The battle was fought in 1944 between the Japanese army and the Allied forces in the areas surrounding Imphal. While reiterating the important ancient links between Japan and India’s northeast, the ambassador also spoke about the potential of cooperation in a number of areas, with a special thrust on greater people-to-people contact. Earlier, in March 2017, Assam Chief Minister Sarbananda Sonowal while speaking at an India-Japan Partnership for Economic Development in the northeastern region, spoke about the need for greater cooperation. Sonowal also referred to possible cooperation between Assam and Japan in areas like culture, tourism, and education as well as trade and agriculture. While Japanese investments in the Northeast, especially in infrastructure, will facilitate India’s Act East Policy, they will also give a fillip to development and prosperity in the northeastern region, which is imperative for India’s growth. Tridivesh Singh Maini is a New Delhi-based policy analyst associated with the Jindal School of International Affairs, OP Jindal Global University, Sonipat. Sandeep Sachdeva is an independent policy analyst associated with the Jindal School of International Affairs.